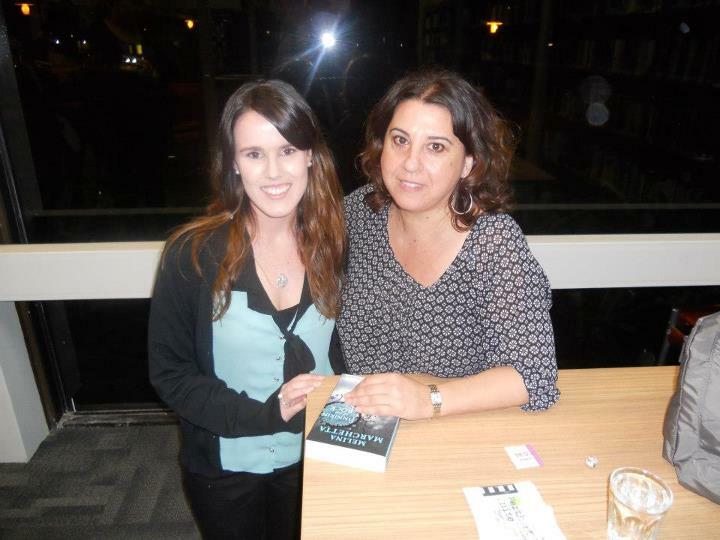 Thanks to the awesome people at Perth YA Fans Unite, who along with Subiaco Library were able to lock down this event with Melina! If you are a Perth YA fan then you definitely need to check out both the Fans Unite blog and facebook page. They need all the support they can get to make future events just as awesome as this one!! Melina is such a lovely person and her talk was so informative. I like hearing the processes author's go through to get to the final product of their book. Melina spoke about the research that she does for her novels. It is not enough for her to imagine a place or see pictures of it. She needs to see locations in person. Because of this she has seen many amazing places, particularly throughout Europe in the case of her Lumatere Chronicles. She travelled to see caves all over Europe for her most recent book Froi of the Exiles. The locations in Froi are inspired by landscapes but she becomes some what of a sculpturist, transforming the location she sees into the location that she writes, taking and altering many different aspects. Melina also spoke about her process of creating a story. She does not start with a plot or setting, it all starts with a character for her. Now I may be paraphrasing slightly here but... "I know when I can't get a character out of my head that they will show up in a story down the line." I have never really thought of the characters coming first then the plot line, so I found this very interesting. Towards the end of the evening Melina opened the room up for questions and this is where everyone got even more excited. Someone asked a question about the movie they are making based on On the Jellicoe Road and Melina spoke about how involved she is in the process. Script writing and picking actors to approach for the leads. The same as with the movie version of Looking for Alibrandi, which Melina was a massive part of. Melina revealed that they have approached an actor who would be the 'perfect Taylor' but she was unable to tell us who it was. There were definitely more than a few gasps through the crowd as everyone took in this information. Then it came to the book signing. Melina signed every book that was put in front of her, but she did more than just sign. She made the effort to talk to each and everyone person that approached her for a signature, which was just lovely. She is so down to earth and a true Australian gem. After the book signing, I was invited by a blogging friend to hang around and grab some dinner, where I got to meet so many lovely bloggers! It was so nice to meet more 'people of my kind' I like to say. YA book bloggers, I feel, are a special breed of person. We just get each other so well. So you can imagine that there was a lot of post Melina Marchetta 'squee-ing' as well as many many conversations about our love for book boys. 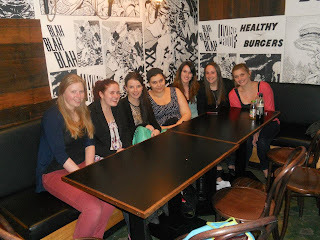 We were just lucky that the staff at Grill'd were very enthusiastic themselves so they didn't mind that we got a little bit rowdy when it came down to who was team Dimitri and who was team Adrian (it nearly tore our group in half!!). We even had one of the staff take a picture for us, all tourist like. Make sure you go and check out their blogs!! Are you an Aussie blogger? Or even a Perth blogger? Let me know in the comments, I love finding Aussie bloggers!! Happy reading and don't forget to check out my giveaway! Ugh. It suddenly feels like my life is over. I'm so glad you enjoyed yourself, though :) SO LUCKY, AMY!! Awesome overview, Amy! Hopefully I'll be posting mine tomorrow. I'm just waiting on the photo's. Jenni - that is the reason we set up Perth YA Fans Unite, so that Perth people could find out about events. Check out our blog or facebook page and you can get the updates. Great stuff :) Meeting up with MM and meeting other bloggers...I've yet to meet another book-blogger in person! This sounds like such a wonderful event and Melina sounds amazing. I'm another Aussie blogger but I'm a Sydney-sider, I'd LOVE to meet other bloggers in person..
That's so exciting! Both Melina and the meeting other bloggers. I don't know any other bloggers from the Gold Coast area.